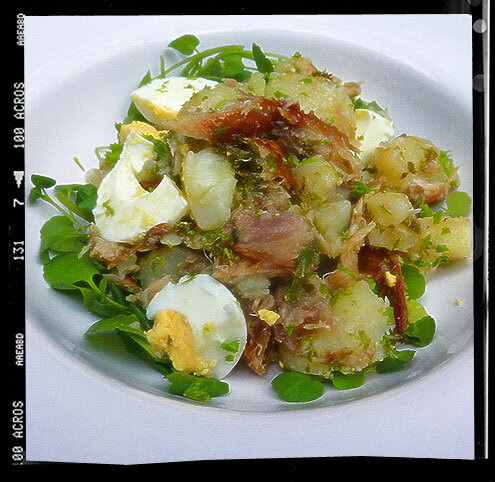 This is a bit like a kedgeree … but with potatoes instead of rice… and smoked mackerel instead of haddock … and horseradish instead of curry powder… In fact now I think about it, nothing like a kedgeree. In that case, consider this a Salade Niçoise with mackerel replacing the tuna and an absence of olives, green beans and anchovies. Nope, again a lazy comparison. Perhaps a hybrid of the two then? A Saledge niçoiseree? Sounds authentic. Start by boiling/steaming your new potatoes until cooked but firm. Also hard boil a couple of free-range eggs. 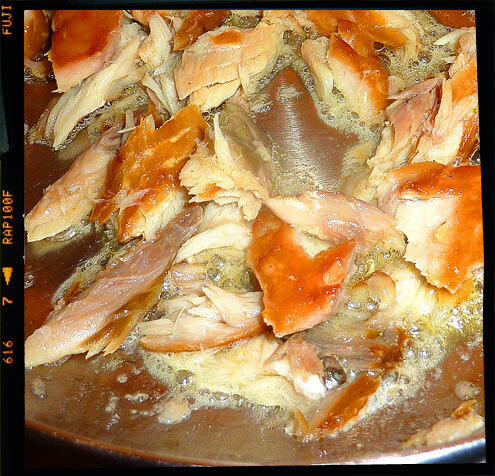 Melt a knob of butter in a large frying pan, add the fish and chopped parsley and cook gently until warmed through. Add the potatoes and crush slightly with a fork. Add the lemon juice and horseradish and stir though. Chuck on the sliced boiled eggs and finely chopped spring onion. Serve warm on a bed of watercress. Verdict: This makes a great midweek dinner, for as well as being very tasty it is also quick and easy to prepare. The horseradish gives it a north European feel which could be further enhanced by the addition of dill. We have made this with both mackerel and kippers and although both are delicious, I’d say the latter slightly had the edge. Entertainment: The fifth and final episode of ‘Line of Duty’. At the end he stepped out in front of a lorry. We cared not. I’ve just made this with potatoes and spring onions dug fresh from the garden. Just to confuse things even more, I added some black olives too. Absolutely delicious. Thanks. It’s a pleasure. Delighted to hear you enjoyed it as much as we did.